Though simple, sweet corn with cheese, choclo con queso, is without doubt the most exquisite of dishes, especially in our ancient city of Cuzco. 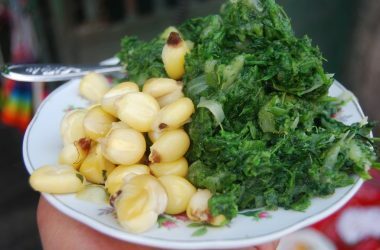 In the nearby Sacred Valley of the Incas they grow the best corn on the cob for this dish, with its big kernals and delicate taste. During the months of November through April it has great demand since they are months of greatest production. 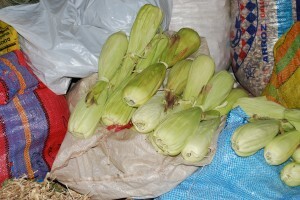 Corn, called sara en Quechua, was the sacred plant of ancient Peru. It belonged to what they called Hanac Pacha, the land above or the sky. They say it accompanied the dead in their journey. 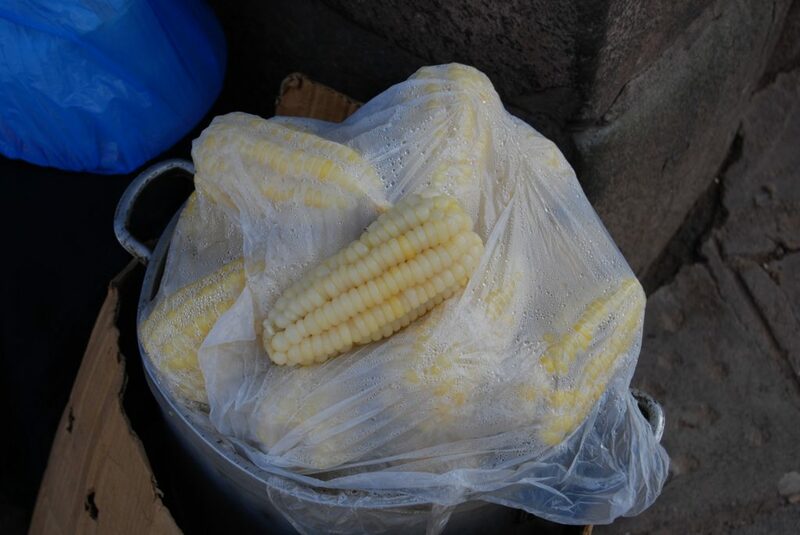 From ancient times an ear of corn was considered sacred and it was also an important food in the time of the Incas. They, in their wisdom, considered corn a great wonder. We can also say that in these months ears of corn are sold right from hot water in the different streets and avenues of the city. This delicious and sweet treat is accompanied by large slices of salty Cuzco cheese. 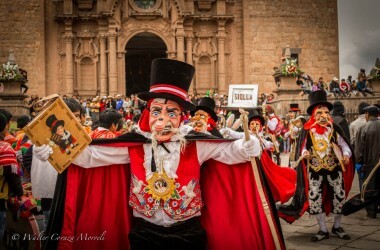 The mamachas, as they call the women who wear traditional clothes of the valleys of Cuzco, offer this snack both in the mornings and evenings. 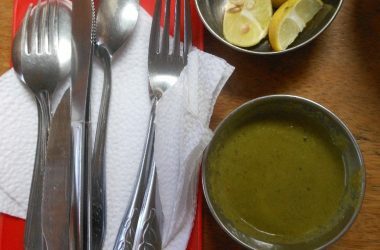 They prepare it over a small burner. They add other ingredients to the boiling water before adding the corn to give it subtle flavor. It is the sacred fruit of the Incas. 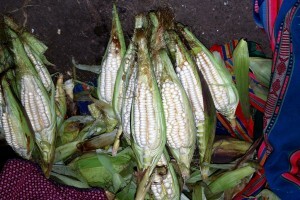 The women serve the corn in a piece of husk from the corn removed before the ear is placed in the water. 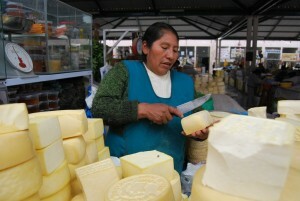 They add a small slice of cheese that they bought in the market and which are brought from different areas of the city. To prepare the corn, one first needs a pot of boiling water. To this the women add husks, sugar, and anise to give it the right flavor and sweetness. Then they bring this to a boil and cook it for at least 45 minutes. Once the water and all is ready, they add the ears of corn and let them cook in the flavored water. We do not know when or how exactly the first cheese was made, thought he Spanish brought this art with them to the descendants of the Incas. But, there are many stories and legends about the origin of cheese. If we look a bit at the history of cheese, we can see that according to Greek mythology the Gods of Olympus who taught people to make cheese, making it also sacred. But there seems to be no evidence for this story. Instead there is an Arabic legend that a nomad found himself with no receptacle in which to transport milk, so when he killed a goat, he used is stomach as a bottle for the milk. That curdled it and made cheese. The two sacred foods, one from the Incas and one from the ancient Western world, corn and cheese, sweet and salty, go together well. One pulls of a large grain of corn and pops it in the mouth to enjoy its wonderful flavor. Then one takes a bite of cheese, and in this way arrives at a perfect combination.